Crystal and gemstone healing is the use of crystals which bring positive changes in the mind, body and spirit, generating healing. Each crystal and gemstones carry different energising and healing properties. Married together with intent, crystals and gemstones can be very powerful in bringing about changes in everyday life. It is believed that crystals influence the subtle body, carrying vibrational properties. Many of you will have heard of Chakra’s. Chakra’s are areas of energy in our body, by placing a crystal on these energy centres we can alter the healing effect and boost energy points to bring better health and wellbeing. In Christian mythology, the city of New Jerusalem walls were decorated with precious stone, each layer built with a different gemstone from Jasper to amethyst. Additionally, in Exodus, the Christian god ordered precious stones to be used in the making of the breastpiece of the high priests garments. In Egypt, rulers were buried with amulets and talismans ( pieces of gemstone ) made from Carnelian, Lapis Lazuli, Turquoise, Quartz and Gold. Everyone with a small understanding of Egyptian healing knows that Egyptian pharaohs were buried with huge amounts of gold to assure a good afterlife. Jade in China has long been a symbol of prosperity and integrity and crystals are used extensively in Chinese feng shui. 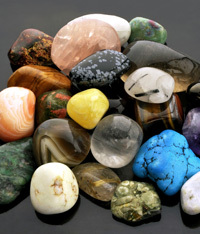 Today there are many therapists using crystals and gemstones in healing and many spiritualists who carry or place particular gemstones around their person or home. Wikipedia say “Believers in crystal healing may carry crystals around with them, believing that they impart healing powers to them wherever they go, or that they have positive vibrations that attract positive events and interactions with others” how many of you before you go to an important event, put on a lucky garment of clothing or take with you a lucky item? Crystal healing in its simplest form is believing in a better wellbeing for yourself. Crystals come in many different colours, shapes and textures and it’s a personal decision to which crystal you are drawn too. Crystals can be used depending on your level of belief, simply as a lucky charm with extra energy benefits or in healing in conjunction with chakra and colour therapy. Gemstones are beautiful crafted pieces of stone and the aesthetic properties of crystals is enough to bring healing in itself. I am sure we all know the feel good feeling of putting on a lovely colourful piece of jewellery and the uplift that brings. Crystals can be used for physical, mental, emotional and spiritual healing and in cleansing negative energies which can often be the cause of illness and discontent.